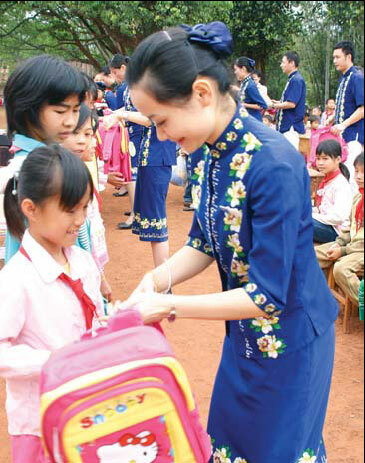 Hainan Airlines employees help students in poor areas of Baisha county in Hainan province. In the 18 years since it was founded, Hainan Airlines has been doing its part to bring China to the world. As one of the nation’s leading carriers, the company was named a five-star airline at the beginning of this year by Skytrax, one of the world’s top independent organizations for research and certification of aviation and air transport. Skytrax President Edward Plaisted noted that "distinct Asian characteristics" set Hainan Airlines apart and enabled it to be crowned a five-star airline worldwide. Airline officials said the responsibility of civil aviation is not only worldwide transportation, but also about international cultural exchanges. The global development of Chinese companies can help "encourage, attract and unite employees with different cultures and dreams". With a concept of "fresh and natural", the airline has promoted traditional Chinese understanding of beauty. It is the first airline in China to use colorful painted planes to add artistic aesthetics to the air journey. The themes include flowers popular in China and natural scenes from the tropical island of Hainan. The performing arts are also part of its air service. A number of classic dramas, such as Madame Butterfly, the Marriage of Figaro, the Lady of the Camellias, Carmen and Romeo and Juliet, have been shown in the cabins of Hainan Airlines flights. The company has also organized or sponsored numerous performances in Hainan. When it became a strategic partner of the National Center for the Performing Arts in 2010, the events were introduced to a larger stage. Artistry is also an element in a recent recruitment poster from the airline that became popular on the Internet. Its design used characters and images to describe the cabin crew’s quality – such as honesty, confidence and knowledge – to form a stewardess dress. Upholding the spirit of humanity as part of its corporate culture, Hainan Airlines has organized a series of charity activities. By the end of this year, the company will have donated nearly 100 million yuan ($15.7 million) to its scholarship fund used to build schools and help college students from China’s less developed areas. When a major earthquake hit Sichuan province in 2008, Hainan Airlines sent over 100 flights with more than 200 volunteered flight hours for disaster relief work. In addition, it donated 15 million yuan to the quake zone to help build new schools. It is carrying out a 10-year plan to fund cataract operations for patients in poor regions of western and northwestern China. The project was launched in July, 2004 in Baima county in Qinghai province and has since provided financial aid to more than 3,000 patients. Similar projects are also held abroad. Sponsored by Hainan Airlines, more than 500 cataract patients in Zimbabwe received free operations in June. In September the program moved to Mozambique, where more than 300 cataract patients were helped in six days. In total, the company had donated more than 700 million yuan to disaster zones, impoverished areas, charity organizations, universities and individuals by the end of July. The Airline was listed in the BrandZ Top 50 Most Valuable Chinese Brands for the year 2011, released by the international brand evaluation and consultancy firm Millward Brown on Dec 13 – the first time for the Chinese company to win the honor. The brand value of Hainan Airlines is estimated at around $427 million, according to BrandZ statistics. The BrandZ Top 50 Most Valuable Chinese Brands ranking is the extension of the BrandZ Top 100 Most Valuable Global Brands. The evaluation is sponsored by WPP, a world leader in marketing communications, and conducted by Millward Brown’s China affiliate Millward Brown ACSR.